For other buildings of the same name, see Trump Tower. Trump World Tower in Manhattan, as viewed across the East River from Long Island City, Queens in May 2010. Trump World Tower is a residential condominium in Midtown Manhattan, New York City. The building was developed by Donald Trump and opened in 2001. The tower is located at 845 United Nations Plaza (First Avenue between 47th and 48th Streets, Manhattan). Construction began in 1999 and concluded in 2001. Designed by the architect Costas Kondylis, the building is 861 feet (262 m) high and has 72 constructed floors (but lists 90 stories on elevator panels) with curtain wall facades of dark, bronze-tinted glass. The resulting large windows allow for extensive views of the East River and Midtown Manhattan. The building is constructed with concrete to improve its wind resistance. In 1961, the 18-story United Engineering Center was built on the site. The Center was demolished to make way for the Trump World Tower. In 1997, Trump and his partners, including the Daewoo Corp., a South Korean chaebol, signed a deal to purchase the site from the United Engineering Trustees for $52 million. Trump also acquired unused air rights from at least seven adjacent low-rise properties, specifically two brownstones, the Catholic Holy Family Church and the Japan Society. Demolition began in October 1998. Prior to construction, many neighbors, including veteran journalist Walter Cronkite, opposed the building due to its height and lack of distinguishing exterior features; among the concerns was that this tower would dwarf the United Nations Headquarters across the street. East Side neighbors who opposed the project raised $400,000 in a bid to defeat it, with investment manager and philanthropist Alberto Vilar contributing $100,000. Opponents argued that the project would block views, was aesthetically unappealing, violated zoning laws, and was out of character with the surrounding neighborhood. The Municipal Art Society also challenged the project on grounds of air pollution. Opponents lost their battle in state court. Construction of the building began in 1999. The construction was financed by two German lenders, Deutsche Bank and Bayerische Hypo- und Vereinsbank. Trump World Tower was briefly the tallest all-residential tower in the world, prior to the completion of the 21st Century Tower in Dubai (2003) and the Tower Palace 3 in Seoul (2004). The tallest of the handful of wholly residential towers completed to date by Donald Trump, it cost approximately US$300 million to construct. The penthouse on the top two floors of the structure which totaled 20,000 square feet (1,858 m²) was priced at $58 million; however, after failing to sell for years, it was split into four different units. Around 2006, Donald Trump was involved in a struggle with the condominium board at the Trump World Tower. Trump requested the assistance of lawyer Michael Cohen, and Trump gained control of the board. New York Yankees star Derek Jeter purchased a 5,425-square-foot condominium for $12.6 million in 2001, and sold it in 2012 for $15.5 million. In 2002, Bill Gates, Harrison Ford, and Sophia Loren were reported to have owned or rented apartments in the building. Trump sold the 45th floor in June 2001 for $4.5 million to the Kingdom of Saudi Arabia, which made the apartments part of its Mission to the United Nations in 2008. Kellyanne Conway owned a condominium unit at Trump World Tower during the early 2000s. Socialite Jocelyn Wildenstein owns a 5,160-square-foot, eight bedroom penthouse in the Tower. In 2015 she listed it for $17.5 million, but it did not sell. In February 2017 she relisted it for $13 million. The World Bar, a two-story bar and cocktail lounge, is located in the building. It is a popular spot among UN diplomats who work nearby. The building and some of its condominium units have previously been featured on NBC's The Apprentice, which featured Donald Trump. It has also appeared on the NBC syndicated television show Extra Season 13 - Ep. 193. The building also featured heavily in the 2007 film Before the Devil Knows You're Dead. The main character of Don Delillo's 2003 novel Cosmopolis holds residence in the top three floors of a building that, while unnamed, is described as the tallest residential tower in New York and located at First Avenue in Midtown Manhattan. In 2003, Esquire magazine held a charity event in the "Esquire Apartment". Besides Trump and his wife Melania, attendees included Uma Thurman, Daniela Pestova, Taye Diggs, and Mark Burnett. Also in 2003, Trump World Tower was the site of the North American "sneak preview" of the Mercedes-Benz SLR McLaren supercar, during which singer Beyoncé Knowles promoted the new luxury vehicle to American media. ^ Nash, Eric Peter., and Norman McGrath. Manhattan Skyscrapers. New York: Princeton Architectural, 1999. Print. ^ Robin Pogrebin, High-Rise Architect Sails Proudly in Mainstream, New York Times (February 5, 2007). ^ "Trump World Tower, New York City". Emporis Buildings. Retrieved 2007-12-02. ^ a b Tracie Rozhon, A New Trump Tower Could Overshadow Diplomacy, New York Times (September 12, 1997). ^ Robin Finn, The Great Air Race, New York Times (February 22, 2013). ^ a b Charles V. Bagli, Trump Starts A New Tower Near the U.N., New York Times (October 16, 1998). ^ Dunford, Martin. The Rough Guide to New York City. New York: Rough Guides, 2009. Print. ^ a b c Blaine Harden, A Bankroll To Fight A Behemoth; Rich Neighbors Open Wallets To Battle Trump's Project For Residential Skyscraper, New York Times (September 8, 1999). ^ a b Charles V. Bagli, Opponents of Planned Trump Tower Lose Battle, New York Times (November 22, 2000). ^ Hirsh, Michael (December 21, 2018). "How Russian Money Helped Save Trump's Business". Foreign Policy. Retrieved January 18, 2019. ^ Schwirtz, Michael (July 2, 2017). "Trump Foot Soldier Sidelined Under Glare of Russia Inquiry". The New York Times. ^ Elizabeth A. Harris, Seeking Designated Buyer, New York Times (September 8, 2010). ^ Gina Pace & Jason Sheftell, Derek Jeter sells Trump World Tower home for $15.5 million, New York Daily News (October 11, 2012). ^ a b Julia Chaplin, BOÎTE; Understated, In Trump Style, New York Times (October 27, 2002). ^ Brown, Stephen Rex (September 4, 2016). "EXCLUSIVE: Donald Trump made millions from Saudi government". The New York Daily News. Retrieved September 4, 2016. ^ Orden, Erica (October 12, 2018). "Saudi disappearance puts spotlight on Trump's business ties". CNN. In June 2001, he sold the 45th floor of Trump World Tower to the Kingdom of Saudi Arabia for $4.5 million, according to a publicly filed deed for the transaction. In 2007, the Saudis received permission from the New York City Department of Buildings to combine the residential units into a single space to house the Saudi Mission to the United Nations, public records show. ^ Gordon, Lisa (7 Feb 2017). "'Catwoman' Socialite Jocelyn Wildenstein Asks $13M for Unit in Trump World Tower". realtor.com. Retrieved 12 February 2017. ^ a b Dulcie Leimbach, Near the U.N., Assembling for Drinks, New York Times (September 18, 2013). ^ "The Anachronistic Quality of the Word Skyscraper". bauzeitgeist. ^ "Beyonce Knowles is at Trump World Tower to introduce the..." Getty Images. October 22, 2003. Archived from the original on October 16, 2018. Beyonce Knowles is at Trump World Tower to introduce the Mercedes-Benz SLR McLaren to North America. 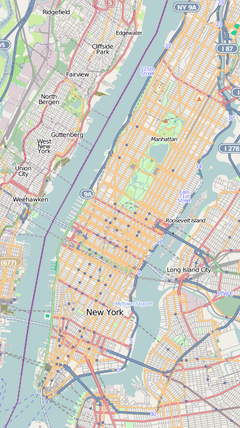 Wikimedia Commons has media related to Trump World Tower.